Reflex Sympathetic Dystrophy Handout | Dr. Thomas Trumble, M.D. What is Reflex Sympatheic Dystrophy (RSD or CRPS)? RSD is a condition that was diagnosed as early as the civil war, but is still poorly understood. An injury to the nerves and/or soft tissues results in an altered pain pathway. Normal stimulation is perceived as painful and the sympathetic nervous system is altered with increased sweat formation, color, and swelling (Figure 1). Sometimes, the initial injury can seem relatively innocuous such as a nondisplaced distal radius fracture or even a fracture of the shoulder. A variation of reflex sympathetic dystrophy is shoulder-hand syndrome where an injury to the hand results in severe shoulder stiffness. The pain fibers travel through a complex rather than a spinal cord to reach the brain. The exact location of the pain gateway in the human body is not known, but has been assumed to be within the receptors of the spinal cord. Some type of short circuit occurs where the stimulation from a painful stimuli which should be controlled, results in an exaggerated stimulation of the sympathetic nerves in the hand, or even in the lower extremity. As noted above, this can occur in injuries such as wrist fractures or injuries that damage a nerve. The more severe the nerve injury, the more likely it is for the person to have RSD. During the original diagnosis of the civil war, soldiers had musket balls that damaged portions of their major nerves exiting from the spinal cord. RSD can occur at any age group. The highest incidents are in the women 40-60 years of age. How do we diagnose RSD? For the most part, the diagnosis is a clinical. Sometimes it is necessary to make sure that an infection is not missed, so we obtain cultures and blood tests. In the patients with RSD, there is no evidence of infection on blood tests such as white blood cell count, erythrocyte, sedimentation rate, and C-reactive protein. The hand still appears red, swollen, and inflamed. A hallmark is loss of joint motion and parts of the hand that were not injured. The patient with distal radius fractures loses finger range of motion despite the fact that there was no injury to the fingers. The hair pattern often changes with increased hair growth and increased sweat formation especially in the early stages. In the late stages, the hand can actually be seen cool and atrophied. X-rays can show decreased bone density in unusual pattern that occurs in bones that were not damaged as part of the injury. Bone scans correlate with the increased blood flow showing an increased uptake of the radioactive trace that is used for the scan. These can demonstrate a shunting where the blood bypasses the normal circulation to define capillaries (figure 17-4 from the new textbook). The critical aspects of diagnosis are still clinical examination combined with the patient’s history of having had a remote injury. How do we treat RSD? The earlier the RSD is treated the better. 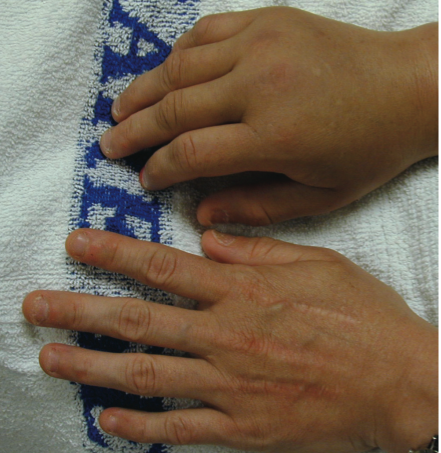 There is minimal stiffness in digits, only mild swelling and increased pain levels. Adequate pain medication, make sure the splints are not too tight, eliminate any source of infection and oral medications such as gabapentin or Lyrica (combine with early therapy to encourage gentle painless range of motion). There are signs of significant digit stiffness and digits that were not injured. There is also the appearance of loss of skin creases since the digits are no longer moving and the skin creases had become blurred over the back of the fingers and hand. These patients are best treated with special nerve blocks,controlling the sympathetics. A series of three blocks can dramatically improve the patient’s pain, swelling and stiffness. These are then combined with a therapy program and oral medication. Obviously, these can cause devastating functional loss to the patients. It is important to diagnose this early and be on the lookout when there has been any history of even relatively minor trauma for this presence. The key aspects are still a clinical diagnosis and progressing the patient to early treatment in particular a therapy program that reduces any painful stimulus.